Silly AVATAR sleeps on his back like a person. He & 2 littermates- BLUE ANGEL & APACHE- were trapped in E. Patchogue at 8 weeks. “fly” into your arms so you take them home. 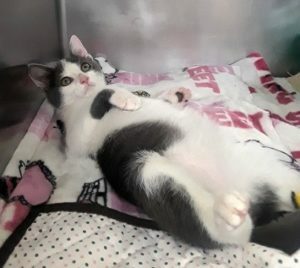 This entry was posted in Adopted, Adopted Cats, Cats, Male, Petco - Syosset, Under 6 Months. Bookmark the permalink.